After creating several Native-American styled and Moccasin customs lately Chef has become obsessed with feathers. He has taken to the all white Air Force 1 High to continue his exploration into moccasin-inspired works with a greater emphasis on feathers. The result is the Icarus-like custom you see here. 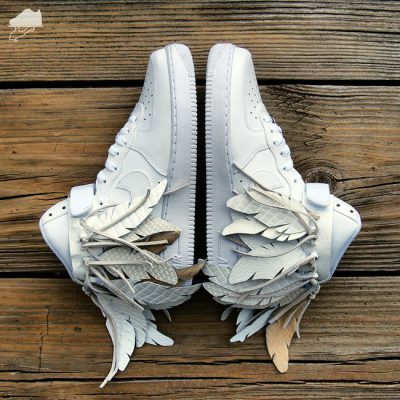 He calls this piece the “Air Force 1 Fly High” and has been naming the project his “Floccasin” line (flying moccasin) of which he has several versions. Most moccasins will only have a few feathers, just as accent pieces. Chef of GourmetKickz wanted to see what would happen if he did the opposite, placing all the emphasis on feathers. Each feather is hand cut from luxury leathers; hair on cow hide, embossed ostrich, stingray, baby alligator, crocodile, and rattlesnake. The feathers are attached via a clever strap sheath that is both removable and customizable. The wearer can reduce the number of feathers or add even more to just one side. Ivory suede lacing adds some great detail to the custom and adds drama to the already over the top flying kicks. Chef alerts us that this mainly white colorway is the first of many more to come. Future versions from his “Floccasins” line will include other sneaker silhouettes, more luxury materials, and plenty of colorways and color options. While this type of flashy custom is not for everyone it certainly is artistic! Turn your AF1 Highs into a pair of Floccasins™! This is the first of many custom kits to be sold on this site. This customizable and removable system is currently patent pending with many other styles on the way (which are also filed in the above mentioned patent). This is the pilot design and is hand crafted by Chef Spar, the "TasteMaker" of GourmetKickz® "Food For The Sole". This premier style is called the Fly-Strap™. The feathers are paired together so they each face forward and looped by hand using albino lizard sinew. This loop allows you to string the feathers any way you like. You can be creative and string the feathers on in any way you like. The colorway if this kit will work with any white, off white, tan, net, rope, or gum colored kicks. Be creative, you do not have to attach these to all whites. The images shown are just a suggestion, so use your imagination. A total of 16 pairs of feathers are included, that is 32 feathers in all! The price includes JUST the kit, AF1 not included. A patent search was done prior to filing, it is the firm belief of the Inventor Brian "Chef" Spar that a Patent WILL be granted. Entities who copy willfully with notice of the above described application will be prosecuted to the full extent of the law once he patent is granted. Damages will be retroactive starting on the date of notice. 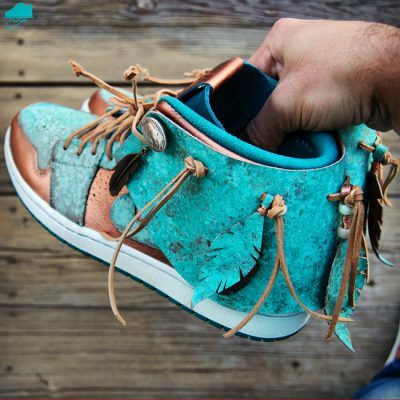 This custom piece of wearable art is a revisit to Chef's original Patina Pack AJ1. It features similar color blocking with one major difference, the patina moccasin style sheath at the heel. This sheath features suede fringe and hand cut patina and copper feathers. The shoe comes with suede laces and the original laces. The sheath is removable via the buffalo nickel and turquoise accents. This custom piece also comes with a custom patina box. You may purchase a matching denim and patina sleeve trucker jacket by clicking here. This custom piece is limited to 20 pair and is only available in the sizes listed. You may not send in your sneaker to have this custom redone, if your size is not available please use the Commission a 1 of 1 page to get something similar made (select the $600 budget to have an AJ1 or AF1 included). This custom piece will ship in about 6 weeks or less. Custom will ship in the order they are purchased. Each piece will be numbered.